Pastel yellow and black and white polka dots. It could be a hot mess. Or it could be just plain hot. I must say by the end of this project I am declaring it SUPER AWESOME!!! Also, for some bizarre reason I also decided that I needed I faux tux front to the whole business. Does this make sense? Only in Amanda-land. Did it work? I’m thinking it did! I’m really proud of this little feature! I removed the extra fabric allocated for the pleat on the tank front pattern piece and cut my fabric to this size instead. 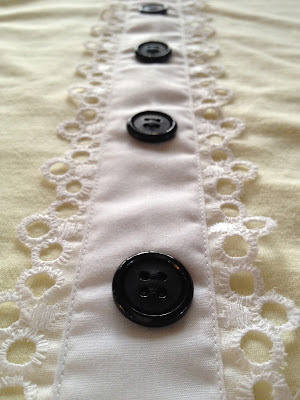 I then cut some white poplin to the width of the pleat allocation plus a seam allowance, sewed it up, pressed it flat and added a strip of eyelet lace down each side and some black buttons for the final flourish. May I take a moment to feel a little proud of myself and say check out how neat the top stitching is as well as how matchy matchy the lace is on either side? Rad, huh?! Nice tank back. Or is that tank front? Now Amanda six months ago would have gotten cross and started unpicking. Sassy September Amanda merely laughed (somewhat hysterically I am sure) and dragged out the front pattern piece, traced the neckline and armhole onto my fancy tux panel and got hacking. The top still work out, my hours of fussiness weren’t wasted and I got to add some fierce gathers under the front of the armhole. Some may call them evidence of my mistake. I call them underarm ruching of POWAH! 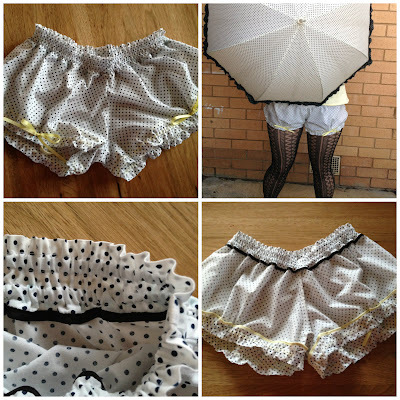 So let’s talk mini-bloomers. Firstly, cutest name ever. Secondly, I think I am a little in love with these. I decided if they were going to be sleepwear I was going to treat myself to some fancy finishings. 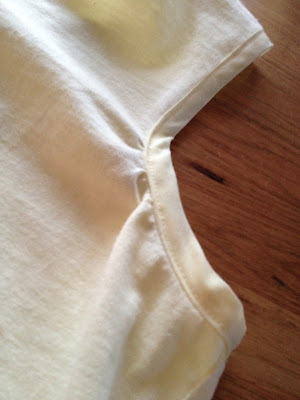 I used black satin bias binding to finish the top seams, yellow cotton bias binding to finish the bottom seams and then french seamed all of the seams inside. A little bit over the top? Heck, yes! But I wanted to see if I could do it and I must admit it looks rather fancy pants… See what I did there? It’s lame joke time at Bimble and Pimble! These went together really easily except the button holes to thread the ribbon on the legs through but that is a continuing sore spot between Sweet Violet the Janome and myself… Otherwise the instructions were super clear (thanks yet again, Colette) and I must admit I will be making these again. I mean, could the ribbon ties be any cuter?! How easily everything went together. Had I not been Ms Fussy McPantsdon I could have knocked a whole jammie set out in an afternoon. How customisable the Sorbetto tank is. I mean, I have made some of these before but this was the first time I played with notions on it. Double check my pattern pieces. Duh. 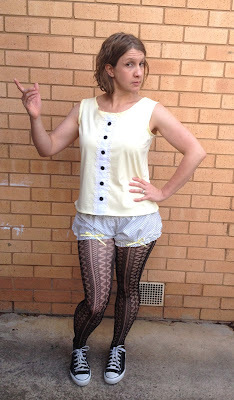 Go up a size in the bloomers. They are comfy as they are but I like a bit more room in my sleep wear. Have an actual martini in hand whilst I take pictures of me being all snooty in my faux tux! Invisible martini! 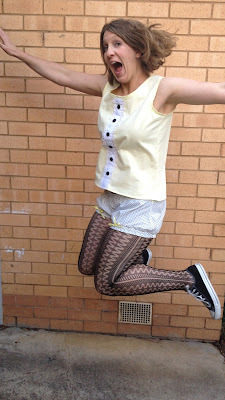 You could say I love these new jammies so much I’m jumping for joy… Oh, yes I did segway lamely into a novelty photo! Very cute! I did laugh when I read the top was backwards – but it was certainly a sympathetic laugh rather than a ‘fool’ laugh. We’ve all been there 🙂 But they’re so cute, and that front panel looks so neat! I thought it was one piece of trim rather than separate. 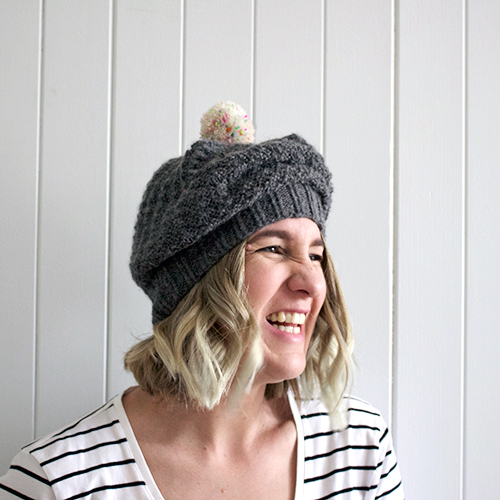 You are as cute as a button…. Thanks, Zo! I’m really happy with the front panel hence the make do and mend scenario. I still can’t believe I mixed them up- it cracks me up too! Naw… thanks Jaxie 😀 It’s the buttons on the front that give me the illusion of cute as a button! I give you an ‘A’ for everything! Only you would associate a tuxedo with sleepwear – although I guess it is After 5 wear! 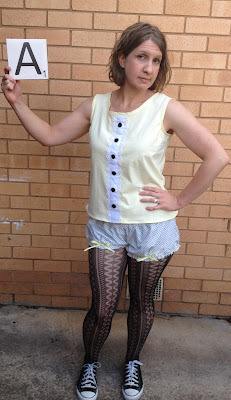 I think I may try those bloomers in my husband’s old business shirts… although they say never to mix business & pleasure! 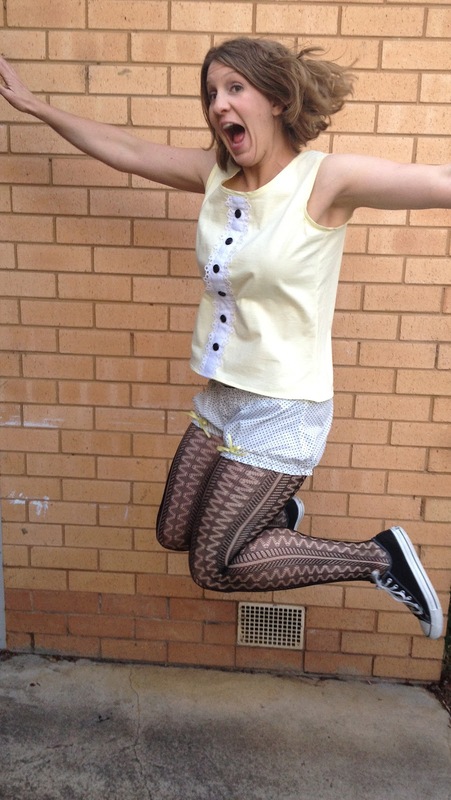 I’m thinking you are looking amazing and I love the outfit – including the tights and the converse. Wear it! 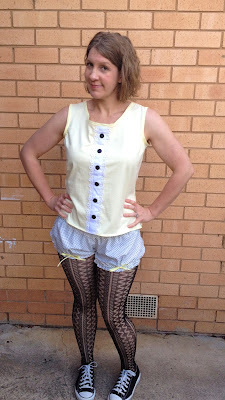 Or if you don’t feel comfortable in the bloomers, wear the top with cut off jeans! Super cute – we don’t do letter grades here, but I’ll give you 12! (yes, highest grade..). Thanks, Lizzy 😀 Get crazy with the bloomers- especially if husband’s shirts are striped. That would look super cute! Ok that is just damn skippy precious. You may quote me! THE BLOOMERS ARE CUTE AS!!! I really like the faux-tuxedo as well. The whole outfit looks so comfy and cute!!!!! Thanks, Rach! They’re super comfy!!! How burlesque-y! 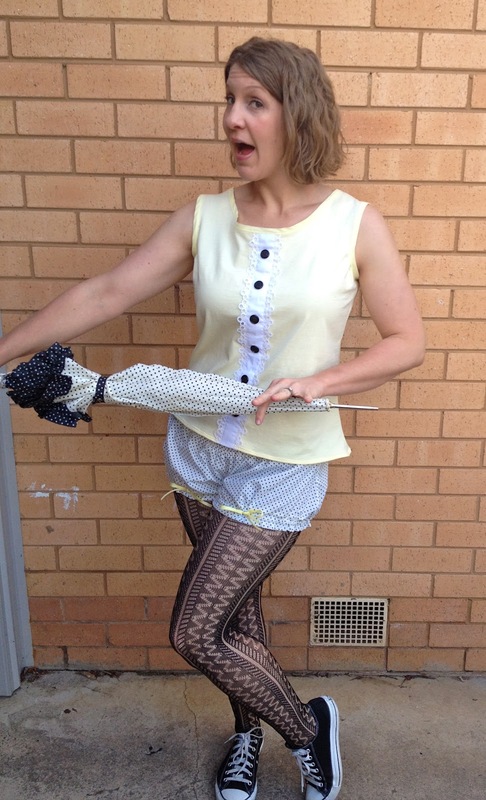 I love it all: the trimming on the tops, the cute bloomers, the umbrella! Very cute bedtime outfit. Those bloomers are great, I should really make myself a pair. I haven’t seen too many versions online so great to see your cute version. Thanks, Mela! 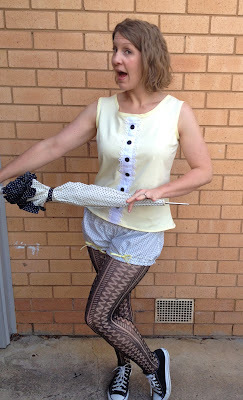 I kinda love the brolly with the look- who knew you could match bloomers to an umbrella?! Ooh, this is so cute! Love the little set! I’ve been meaning to make myself a little PJ set with these two patterns, but alas, so many plans, so little time! This is beyond adorable, though, and I suspect you’ll influence many a follower to make their own jams! Thanks, Ginger! They are so crazy comfy and super easy.Give in to the RAD PJS! Pretty darned cute! Wow, I’m impressed with the tux bit. Sounds like “heirloom sewing” techniques I love reading about and believing one day I’ll get round to doing. 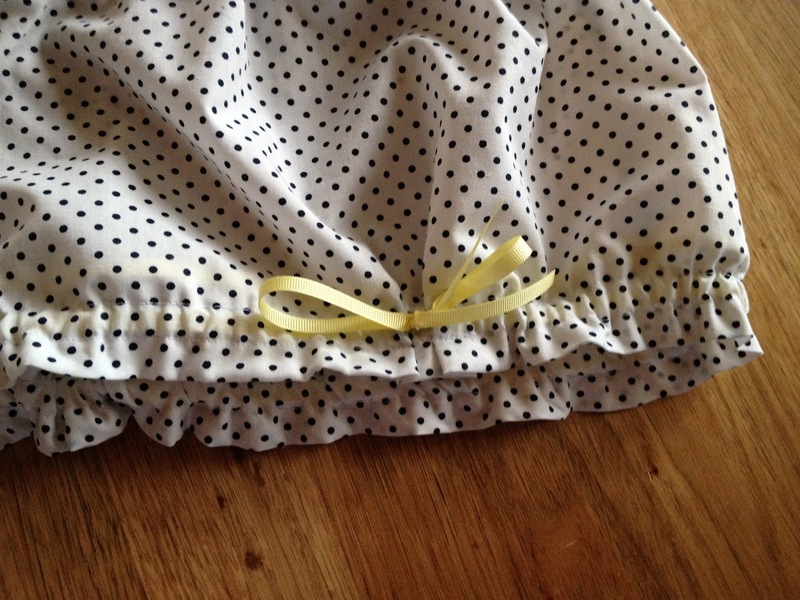 And hey great idea for the mini-bloomers as jammie bottoms. 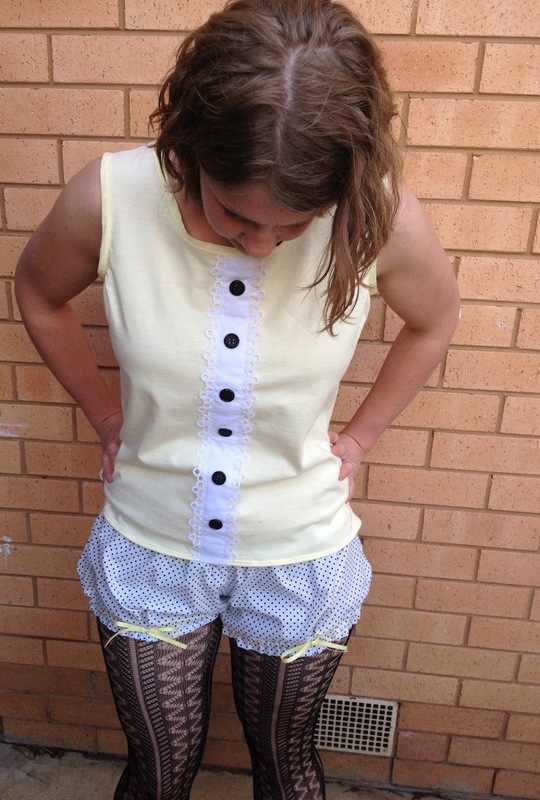 I made a pair and wear them as undies. Very comfy under a wide skirt. And so much fun. Thanks, Bec! I love me some Sorbettos!